The ability to share large, higher-quality images, videos and websites has transformed higher education into a multimedia experience, and projectors have become the centerpiece. To tap into the state of the art for higher education projectors, AV Technology surveyed 150 buyers and users of projectors at a wide variety of colleges and universities to see what’s important to them. 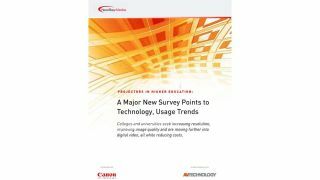 In addition to asking about their current fleet of projectors and how they’re connected, we surveyed what they’re looking for two-and five-years in the future, including resolution, light source, imaging technology and assortment of ports. This new research reveals how colleges and universities are joining the movement towards full HD and eventually 4K resolutions, the timeline for integrating digital video in the classroom as well as emphasizing lamp-free technologies, all while being cost-efficient. Download the research to find out full results.